Many people are successful salespeople because of their contacts. Being able to manage their contacts is key to success. You may choose to have online software or have something installed on your phone or desktop. I remember using a palm pilot back in the day to manage leads and contacts. Of course, smart phones have taken over and many are fine with the contact features on their phone, but some may want more to manage their contacts. First, Webtalk needed to create a contact relationship management (CRM) platform . Then, they needed to get people to use it. They have over 1.3 million users as of today, October 31st, 2019. They have invested a lot of money to make these tools free to beta testers. Users are joining the network and helping grow the daily traffic to the website. Webtalk is not asking for money. They are asking for some of your information and asking you to share a referral link with others. If you are on the major sites, like Facebook, Twitter, Linkedin, Instagram, and Pinterest, your info is already out there on the web. The thing I like most about the CRM is the ability to separate professional and personal contacts. I don’t think any of the major sites have done a great job helping the user in the way I see it on Webtalk. Many affiliate marketers and business people have taken the approach to “wait and see”. Before you go any further, please know I am someone that has signed up at Webtalk and have shared the site with friends, family and colleagues. I feel it is worth my time and theirs. If it turns out to never do anything before it fades into the growing list of scams and schemes, then I will be disappointed. Fortunately, I have not given any money to Webtalk. They are not asking for any money to help them grow their user database. They have a lot of projects in the works. If they can launch them, many will be happy for joining early and sharing the site. Advertisers will come, generating revenue to the company. Some users will choose to upgrade their account to use the Pro Tools (LinkedIn has done something like this) . I have never upgraded over there but I have seen some that have and they seem to like what Linkedin has to offer their subscribers on the paid services. Webtalk will generate revenue with the upgrades. I have no doubt people are going to sign up for the Pro Services. Some users will choose to sell products and pay a fee to Webtalk to help with the transaction. A lot of companies do this and new companies will continue to offer commerce solutions in the future. Many commerce solution have launched and closed or been bought out. Product sales will generate revenue for Webtalk just like it does on amazon, walmart, ebay, shopify, etsy, etc. Some users will choose to sell their services to other users and pay a fee to webtalk that made the transaction possible. Think of companies like fiverr or upwork. These fees will generate revenue for the company. There are a lot of projects in the works at Webtalk with the goal to generate revenue for the company. I don’t know when they plan to launch all of these functions. I hope it is sooner rather than later, but I do want them to make sure they work before they release them. I have seen too many services not work as designed and projected failure. I feel they are doable. You may disagree. I have agreed to beta test every product that ask us to test. Is it worth taking a look at Webtalk? They are offering a chance to join the Webtalk network as an affiliate and get a share of the revenue they generate. It is free to join as a beta tester. All beta testers will have opportunity to join affiliate program for free when it launches. According to the founder, you will never be required to purchase anything to qualify for commissions. You do have to sell something! DUH! You knew there was a catch right? No one makes money until someone sells something. I have been in many affiliate programs in my career as an Internet Marketer. Webtalk is making some big claims. They may fall short, but I am rolling the dice and betting they will become a player in the social media/CRM world and will do what they claim. 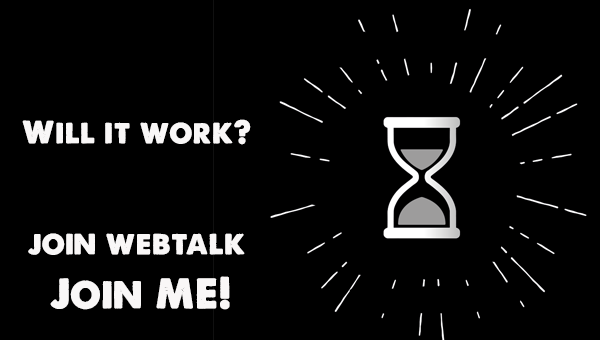 If you want to join me, you can get an invite to webtalk from me. Once you have an account, connect with me and I will help you with any questions you might have about the site. I have been on the platform and I really like it so far. If you are looking for a review, check out this Webtalk Review I wrote last month. What are your thoughts on Webtalk? Let me know what you think about Webtalk below. I will try to respond with questions and concerns as quick as I can. Thanks for your time in reading this and your feedback if you choose to give it. Webtalk looks like an interesting opportunity. While I’m not sure I believe all the hype that it’s going to ‘overtake Facebook’ as the next big thing, it’s certainly worth keeping an eye on. I saw a big spike in Webtalk interest about a month ago, but it seems to have died down since then. Could you explain why that is? Did Webtalk spend a bunch on advertising or was it just word of mouth? Thanks! I think they were able to reach a few users that have been very successful in sharing and building lists. Webtalk grew really quick in September and October causing some issues with resources. I believe that had to boost up their infrastructure. The email systems took a hit and I think that is where they hit the snag. I don’t think they have spent much money on advertising at all. They are relying on affiliate marketing right now with the only way to join is through the link of an existing member. Not going to lie. I have heard good and bad about Webtalk. Its been in beta for so long and that to me is a red flag. Now Im not saying its a scam or anything. I just think inside there may be some ulterior motives. Of course thats just an opinion and I hope Im wrong. I think I will join just to ride the wave but Im not going to expect much. I hear ya Dale. It has been in private beta for a while, but the growth has just started. I just heard about it last month. Building a big database is the goal of many launches. I can see me using this site like it works now. I hope the projects and my time works out. See you on the inside! Very interesting topic. I have heard about WebTalk but honestly I was thinking that it is some sort of fraud. I mean, if it is true that we can earn some extra cash with this platform that would be great. I will try it for sure but with caution. Thank you a lot for revealing information about this new platform. Thanks for the comment Daniel. I have read a lot and tested a lot. There are quite a bit of misconceptions. Many say its MLM. They offer commission through affiliate links. They don’t require you to buy anything and don’t have any kind of balance requirements like left, right, forced matrix or any of that stuff. This is interesting. It seems more people are starting to talk about Webtalk but it’s still not very many. I’m still trying to get my head around the “older” platforms but I think I should consider Webtalk more seriously now. If they’re just starting out, won’t it be a while before they have enough traction for marketers? If there’s only a million on Webtalk but already a billion on FB, why would marketers go to Webtalk? I have made money with facebook, but as of right now facebook has never paid me directly to use the site, share content or share the site with others. Webtalk claims it will do that and I am willing to give it a chance. Yes 1 Billion on facebook! If I had all my friends on facebook follow me to webtalk, I would be very happy to spend all my time there. 1 Million is not a lot but probably more than many startups at this point. Until I can get a good number I will use both, but happier on Webtalk! Thank you for the overview of the Webtalk service. I joined some time last month but haven’t done anything else with it as of yet. It will be interesting to see if their plans pan out. I’m looking forward to seeing how this service matures and if it will be a contender in the social media landscape. Just like you, I am hopeful that it will be. Thanks for the Feedback Scott. I have shared it with a lot of people and been able to connect with many of them. There are a lot of friends I have met through various sites on there and been able to connect with them also. I hope it does work. I would rather be using something that pays me than waste time over at the big one. I will be honest with you. I have been approached by various people recently. There is a big buzz going on about Webtalk. I have heard they have been in beta for 8 years,is that true? If, I think that is very long. The fact they have already 1.3 million users looks like a lot but compared to other companies they are still babies. Your review is very good and gives a lot of details but sorry to have to tell you I will stay in the wait and see group some more time. No worries Taetske. I know many are skeptical. I just heard about it last month. Yeah 1.3 Million is not a lot compared to most bigger sites. If they are able to produce the products and accurately track the sales. It will be pretty cool to see the commission checks. I had heard of Webtalk, but was unfamiliar with it until reading your article. Thanks for posting it. I’m not quite sure just how long they’ve been around, though I see an article posted in the Tampa Bay Business Journal from 2014 that indicated they were hoping to take on Facebook, Twitter, and LinkedIn by emphasizing its privacy and security features (that article focused on how they had acquired $300k in early-stage funding). Your article, together with the Tampa article makes me think that they are struggling a bit–taking on the big three seemed like a tall order, after all–but haven’t given up and are still plowing ahead. I hope that they succeed and it seems like posts such as yours will help them to get there. Thanks Kevin. I think they are heading in the right direction to achieve many of their goals. If they didn’t set their sites on companies like the big ones, I would be concerned. They have a way to go. I plan to continue to test it until i see a reason to not share it. Hi there, I love the pop up in the bottom right with a friendly photo, feels welcoming. I am not at all familiar with Webtalk so pleasure excuse my comments if they are way off 🙂 It looks like an interesting opportunity especially as the beta testers get to earn commissions without buying anything. As someone who doesn’t know Webtalk though I would need to do more research before signing up. For me it would be better to include more information about who Webtalk is competing with, why they are bringing a new product in, what it will do better than the others. Thanks so much for the Edits. I have corrected my typos. I joined Webtalk about 2 months ago. It looked like an interesting platform. I liked that you can separate your contacts into different groups such as personal or business. It has the potential to do well, although anything that has money attached to it has to be controlled really well. I must say I have not yet used or researched it enough to give an honest feedback, but it is something that could be a good tool for later use. I do think it is time for a challenger to Facebook as their popularity and dominance begins to topple a little. Also I believe while Facebook can be an amazing business tool, some of their data collection practices are starting to make me feel negative about it. If Webtalk collected less data it would certainly be a good thing. If Webtalk allows (and will continue to allow) all your connections to see posts, rather than the way Facebook throttles and makes us pay for visibility, it would also be step in the right direction. Time will tell but it could be the new way forward. Thanks for the feedback Tim. I agree it may never come close to fb. I do like the features of Webtalk and plan to use them as the site grows. The new features in process are appealing to me. I like what they are doing so far! It will be interesting to see what happens with the big sites in the coming weeks after the elections.